Methionine ( or ; abbreviated as Met or M) is an α-amino acid with the chemical formula HO2CCH(NH2)CH2CH2SCH3. This amino acid is classified as nonpolar as it has a straight side chain that possess a S-methyl thioether (i.e. C–S–C bonding) at the γ-carbon. It is an essential amino acid in all metazoa. This amino-acid is coded by the initiation codon AUG which also indicates mRNA's coding region where translation into protein begins. Together with cysteine, methionine is one of two sulfur-containing proteinogenic amino acids. Excluding the few exceptions where methionine may act as a redox sensor (e.g. ), methionine residues do not have a catalytic role. This is in contrast to cysteine residues, where the thiol group has a catalytic role in many protein. The thioether does however have a minor structural role due to the stability effect of S/π interactions between the side chain sulfur atom and aromatic amino acids in one-third of all known protein structures. This lack of a strong role is reflected in experiments where little effect is seen in protein with norleucine, an straight hydrocarbon sidechain amino acid which lacks the thioether. It has been conjectured that norleucine was present in early versions of the genetic code, but methionine intruded into the final version of the genetic code due to the fact it is used in the cofactor S-adenosyl methionine (SAM). This situation is not unique and may have occurred with ornithine and arginine. Methionine is one of only two amino acids encoded by a single metazoa and yeast, the codon AUA also encodes for methionine. In the standard genetic code AUA codes for isoleucine and the respective tRNA (ileX in Escherichia coli) uses the unusual base lysidine (bacteria) or agmatine (archaea) to discriminate against AUG. The methionine codon AUG is also the most common start codon. A "Start" codon is message for a ribosome that signals the initiation of protein translation from mRNA when the AUG codon is in a Kozak consensus sequence. As a consequence, methionine is often incorporated into the N-terminal position of proteins in eukaryotes and archaea during translation, although it can be removed by post-translational modification. In bacteria, the derivative N-formylmethionine is used as the initial amino acid. S-Adenosyl-methionine is a cofactor derived from methionine. The methionine-derivative S-adenosyl methionine (SAM) is a cofactor that serves mainly as a methyl donor. SAM is composed of an adenosyl molecule (via 5' carbon) attached to the sulfur of methionine, therefore making it a sulfonium cation (i.e. three substituents and +ve charge). The sulfur acts as soft Lewis acid (i.e. donor/electrophile) allows the S-methyl group to be transferred to an oxygen, nitrogen or aromatic system, often with the aid of other cofactors such as cobalamin (vitamin B12 in humans). Some enzymes use SAM to initiate a radical reaction, these are called radical SAM enzymes. As a result of the transfer of the methyl group, S-adenosyl-homocysteine is obtained. In bacteria, this is either regenerated by methylation or is salvaged by removing the adenine and the homocysteine leaving the compound dihydroxypentandione to spontaneously convert into autoinducer-2, which is excreted as a waste product / quorum signal. 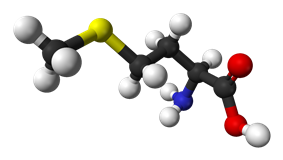 This amino acid is also used by plants for synthesis of ethylene. The process is known as the Yang Cycle or the methionine cycle. As an essential amino acid, methionine is not synthesized aspartate family, along with threonine and lysine (via diaminopimelate, but not via α-aminoadipate). The main backbone is derived from aspartic acid, while the sulfur may come from cysteine, methanethiol or hydrogen sulfide. First, aspartic acid is converted via β-aspartyl-semialdehyde into homoserine by two reduction steps of the terminal carboxyl group (homoserine has therefore a γ-hydroxyl, hence the homo- series). The intermediate aspartate-semialdehyde is the branching point with the lysine biosynthetic pathway, where it is instead condensed with pyruvate. Homoserine is the branching point with the threonine pathway, where instead it is isomerised after activating the termainal hydroxyl with phosphate (also used for methionine biosynthesis in plants). Homoserine is then activated with an phosphate, succinyl or acetyl gorup on the hydroxyl. In plants and possibly in some bacteria (viz. ) phosphate is used. This step is shared with threonine biosynthesis. In most organisms, an acetyl group is used to activate the homoserine. This can be catalysed in bacteria by an enzyme encoded by metX or metA (not homologues). In  The physiological basis for the preference of acetyl-CoA or succinyl-CoA is unknown, but such alternative routes are present in some other pathways (e.g. lysine biosynthesis and arginine biosynthesis). The hydroxyl activating group is then replaced with cysteine, methanethiol or hydrogen sulfide. A replacement reaction is technically a γ-elimination followed by a variant of a Michael addition. All the enzymes involved are homologues and members of the Cys/Met metabolism PLP-dependent enzyme family, which is a subset of the PLP-dependant fold type I clade. They utilise the cofactor PLP (pyridoxal_phosphate), which functions by stabilising carbanion intermediates. If it reacts with cysteine, it produces cystathionine, which is cleaved to yield homocysteine. The enzymes involved are cystathionine-γ-synthase (encoded by metB in bacteria) and cystathionine-β-lyase (metC). Cystathionine is bound differently in the two enzymes allowing β or γ reactions to occur. If it reacts with free hydrogen sulfide, it produces homocysteine. This is catalysed by O-acetylhomoserine aminocarboxypropyltransferase (formerly known as O-acetylhomoserine (thiol)-lyase. It is encoded by either metY or metZ in bacteria. If it reacts with methanethiol, it produces methionine directly. Methanethiol is a byproduct of catabolic pathway of certain compounds, therefore this route is more uncommon. If homocysteine is produced the thiol group is methylated, yielding methionine. Two methionine synthases are known, one cobalamin (vitamin B12) dependent and one independent. The pathway utilising cysteine is called the "Transsulfuration pathway", while the pathway utilising hydrogen sulfide (or methanethiol) is called "direct-sulfurylation pathway". Cysteine is similarly produced, namely it can be made from an activated serine and either from homocysteine ("reverse trans-sulfurylation route") or from hydrogen sulfide ("direct sulfurylation route"); the activated serine is generally O-acetyl-serine (via CysK or CysM in E. coli), but in Aeropyrum pernix and some other archaea O-phosphoserine is used. CysK and CysM are homologues, but belong to the PLP fold type III clade. Methionine is converted to S-adenosylmethionine (SAM) by (1) methionine adenosyltransferase. SAM serves as a methyl-donor in many (2) methyltransferase reactions, and is converted to S-adenosylhomocysteine (SAH). (3) Adenosylhomocysteinase converts SAH to homocysteine. There are two fates of homocysteine: it can be used to regenerate methionine, or to form cysteine. Methionine can be regenerated from homocysteine via (4) methionine synthase in a reaction that requires Vitamin B12 as a cofactor. Homocysteine can also be remethylated using glycine betaine (NNN-trimethyl glycine, TMG) to methionine via the enzyme betaine-homocysteine methyltransferase (E.C.2.1.1.5, BHMT). BHMT makes up to 1.5% of all the soluble protein of the liver, and recent evidence suggests that it may have a greater influence on methionine and homocysteine homeostasis than methionine synthase. Homocysteine can be converted to cysteine. (5) Cystathionine-β-synthase (a PLP-dependent enzyme) combines homocysteine and serine to produce cystathionine. Instead of degrading cystathionine via cystathionine-β-lyase, as in the biosynthetic pathway, cystathionine is broken down to cysteine and α-ketobutyrate via (6) cystathionine-γ-lyase. (7) The enzyme α-ketoacid dehydrogenase converts α-ketobutyrate to propionyl-CoA, which is metabolized to succinyl-CoA in a three-step process (see propionyl-CoA for pathway). Racemic methionine can be synthesized from diethyl sodium phthalimidomalonate by alkylation with chloroethylmethylsulfide (ClCH2CH2SCH3) followed by hydrolysis and decarboxylation. High levels of methionine can be found in eggs, sesame seeds, Brazil nuts, fish, meats and some other plant seeds; methionine is also found in cereal grains. Most fruits and vegetables contain very little of it. Most legumes are also low in methionine. However, it is the combination of methionine + cystine which is considered for completeness of a protein. (Source: Nutritiondata.com) Racemic methionine is sometimes added as an ingredient to pet foods. There is scientific evidence that restricting methionine consumption can increase lifespans in some animals. A 2005 study showed methionine restriction without energy restriction extends mouse lifespan. Several studies showed that methionine restriction also inhibits aging-related disease processes in mice and inhibits colon carcinogenesis in rats. In humans, methionine restriction through dietary modification could be achieved through a vegan diet. Veganism being a completely plant based diet is typically very low in methionine, however certain nuts and legumes may provide higher levels. A 2009 study on rats showed "methionine supplementation in the diet specifically increases mitochondrial ROS production and mitochondrial DNA oxidative damage in rat liver mitochondria offering a plausible mechanism for its hepatotoxicity". However, since methionine is an essential amino acid, it should not be entirely removed from animals' diets without disease or death occurring over time. For example, rats fed a diet without methionine developed steatohepatitis (fatty liver), anemia and lost two thirds of their body weight over 5 weeks. Administration of methionine ameliorated the pathological consequences of methionine deprivation. Methionine might also be essential to reversing damaging methylation of glucocorticoid receptors caused by repeated stress exposures, with implications for depression. Loss of methionine has been linked to senile greying of hair. Its lack leads to a buildup of hydrogen peroxide in hair follicles, a reduction in tyrosinase effectiveness and a gradual loss of hair color. Methionine is an intermediate in the biosynthesis of cysteine, carnitine, taurine, lecithin, phosphatidylcholine, and other phospholipids. Improper conversion of methionine can lead to atherosclerosis. DL-Methionine is sometimes given as a supplement to dogs; it helps keep dogs from damaging grass by reducing the pH of the urine. It helps to reduce the chances of stones in dogs by chelating heavy metals, such as mercury, lead and cadmium, and removing them from the body. Methionine is also known to increase the urinary excretion of quinidine by acidifying the urine. Aminoglycoside antibiotics used to treat urinary tract infections work best in alkaline conditions, and urinary acidification from using methionine can reduce its effectiveness. If your dog is on a diet that acidifies the urine, you should not use methionine. Methionine is allowed as a supplement to organic poultry feed under the US certified organic program. Paracetamol poisoning - A Methionine-Paracetamol preparation that might prevent hepatotoxicity. ^ Weast, Robert C., ed. (1981). CRC Handbook of Chemistry and Physics (62nd ed.). Boca Raton, FL: CRC Press. p. C-374. .
^ Dawson, R.M.C. et al. (1959). Data for Biochemical Research. Oxford: Clarendon Press. ^ Guedes, R. L.; Prosdocimi, F; Fernandes, G. R.; Moura, L. K.; Ribeiro, H. A.; Ortega, J. M. (2011). "Amino acids biosynthesis and nitrogen assimilation pathways: A great genomic deletion during eukaryotes evolution". BMC Genomics. 12 Suppl 4: S2. ^ Bigelow, D. J.; Squier, T. C. (2005). "Redox modulation of cellular signaling and metabolism through reversible oxidation of methionine sensors in calcium regulatory proteins". Biochimica et Biophysica Acta (BBA) - Proteins and Proteomics 1703 (2): 121–34. ^ a b c d e f g h i j k l m n Ferla, M. P.; Patrick, W. M. (2014). 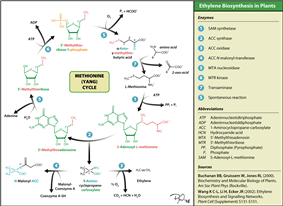 "Bacterial methionine biosynthesis". Microbiology 160 (Pt 8): 1571–84. ^ Cirino, P. C.; Tang, Y; Takahashi, K; Tirrell, D. A.; Arnold, F. H. (2003). "Global incorporation of norleucine in place of methionine in cytochrome P450 BM-3 heme domain increases peroxygenase activity". Biotechnology and Bioengineering 83 (6): 729–34. ^ Alvarez-Carreño, C; Becerra, A; Lazcano, A (2013). "Norvaline and norleucine may have been more abundant protein components during early stages of cell evolution". Origins of Life and Evolution of Biospheres 43 (4–5): 363–75. ^ Jukes, T. H. (1973). "Arginine as an evolutionary intruder into protein synthesis". Biochemical and biophysical research communications 53 (3): 709–14. ^ Ikeuchi, Y; Kimura, S; Numata, T; Nakamura, D; Yokogawa, T; Ogata, T; Wada, T; Suzuki, T; Suzuki, T (2010). "Agmatine-conjugated cytidine in a tRNA anticodon is essential for AUA decoding in archaea". Nature Chemical Biology 6 (4): 277–82. ^ Muramatsu, T; Nishikawa, K; Nemoto, F; Kuchino, Y; Nishimura, S; Miyazawa, T; Yokoyama, S (1988). "Codon and amino-acid specificities of a transfer RNA are both converted by a single post-transcriptional modification". Nature 336 (6195): 179–81. ^ Mino, K; Ishikawa, K (2003). "A novel O-phospho-L-serine sulfhydrylation reaction catalyzed by O-acetylserine sulfhydrylase from Aeropyrum pernix K1". FEBS Letters 551 (1–3): 133–8. ^ "National Nutrient Database for Standard Reference". U.S. Department of Agriculture. Retrieved 2009-09-07 . ^ Liz Palika. New York: Howell Book House. 1996. ^ Alleyne, Richard (2009-12-03). "Vegetarian low protein diet could be key to long life". The Daily Telegraph (London). Retrieved 2010-05-12. ^ Miller, Richard A.; Buehner, Gretchen; Chang, Yayi; Harper, James M.; Sigler, Robert; Smith-Wheelock, Michael (2005). "Methionine-deficient diet extends mouse lifespan, slows immune and lens aging, alters glucose, T4, IGF-I and insulin levels, and increases hepatocyte MIF levels and stress resistance". Aging cell 4 (3): 119–125. .
^ Grandison, R. C.; Piper, M. D. W.; Partridge, L. (2009). "Amino acid imbalance explains extension of lifespan by dietary restriction in Drosophila". Nature 462 (7276): 1061–1064. 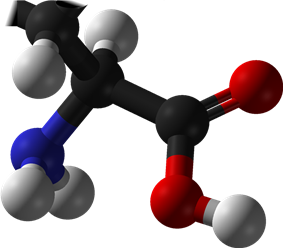 ^ "Amino acid recipe could be right for long life". Science News. December 2, 2009. ^ Richie Jr, JP; Leutzinger, Y; Parthasarathy, S; Malloy, V; Orentreich, N; Zimmerman, JA (1994). "Methionine restriction increases blood glutathione and longevity in F344 rats". FASEB journal : official publication of the Federation of American Societies for Experimental Biology 8 (15): 1302–7. ^ Komninou, Despina; Leutzinger, Yvonne; Reddy, Bandaru S.; Richie Jr., John P. (2006). "Methionine Restriction Inhibits Colon Carcinogenesis". Nutrition and Cancer 54 (2): 202–8. ^ Cavuoto, Paul, and Michael F. Fenech. "A review of methionine dependency and the role of methionine restriction in cancer growth control and life-span extension." Cancer treatment reviews 38.6 (2012): 726-736. ^ Gomez, J; Caro, P; Sanchez, I; Naudi, A; Jove, M; Portero-Otin, M; Lopez-Torres, M; Pamplona, R; Barja, G (2009). "Effect of methionine dietary supplementation on mitochondrial oxygen radical generation and oxidative DNA damage in rat liver and heart". Journal of bioenergetics and biomembranes 41 (3): 309–21. ^ Oz HS, Chen TS, Neuman M (2008). "Methionine deficiency and hepatic injury in a dietary steatohepatitis model". Digestive Diseases and Sciences 53 (3): 767–776. ^ Wood, J.M., et al. (2009). Senile hair graying: H2O2-mediated oxidative stress affects human hair color by blunting methionine sulfoxide repair. FASEB J. 2009 Jul;23(7):2065-75. doi: 10.1096/fj.08-125435. Epub 2009 Feb 23. ^ Refsum H, Ueland PM, Nygård O, Vollset SE; Ueland; Nygård; Vollset (1998). "Homocysteine and Cardiovascular Disease". Annual review of medicine 49 (1): 31–62. ^ "Federal Register". US. Retrieved 2011-03-12 . Rudra, M. N.; Chowdhury, L. M. (30 September 1950). "Methionine Content of Cereals and Legumes".